I received a lovely surprise yesterday from my friend Marcy who lives back East. 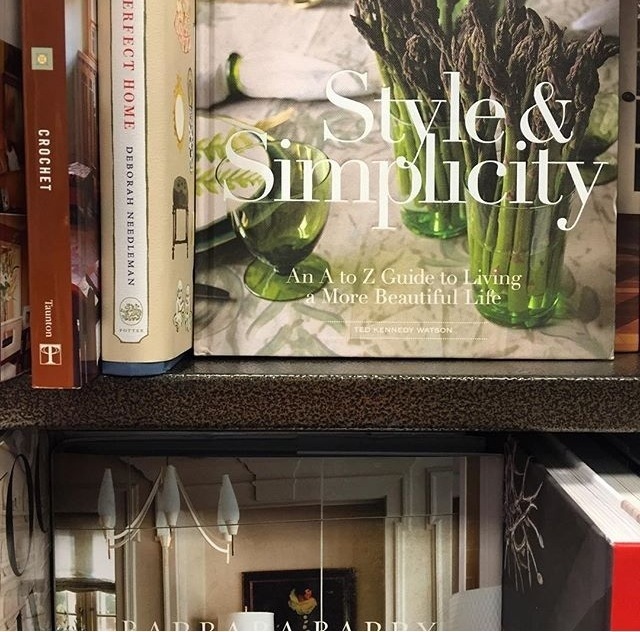 She snapped a photo of Style & Simplicity on the shelf at her local Barnes & Noble in New York. The gesture was so lovely and much appreciated as I love seeing my book in situ, even as we near the second anniversary of the release. I wrote it hoping it would have longevity in the market and not be a title that was out but then gone in a flash. I have so many of you to thank for that, as many of you continue to give it as gifts. I know this because when I work the shops I often sign and personalize them, or I receive notes/e-mails from far & wide telling me of the gift received, which tickles me so. 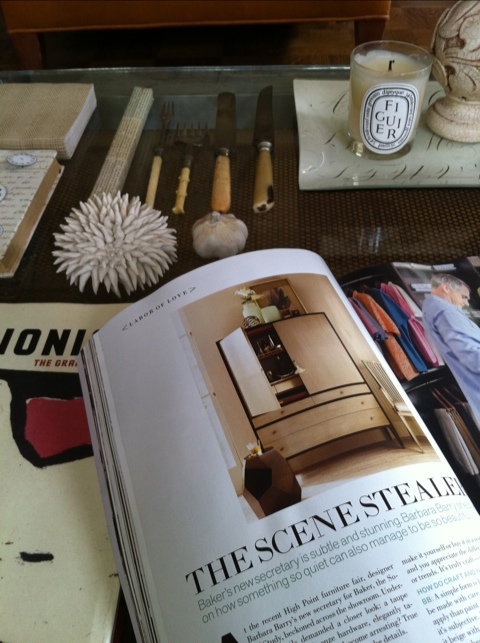 But the thing that most made me smile in this photo was that it also included The Perfectly Imperfect Home by Deborah Needleman and Around Beauty by Barbara Barry. Deborah hosted the swellest book party for me at her home in New York and Barbara wrote the most heartfelt foreword to my book. What a fun coincidence that the three books would be right next to one another. A happy trio, indeed. It really was an action packed few days at the Design Bloggers Conference. Speakers like Charlotte Moss, Windsor Smith, Susanna Salk, and Newell Turner were amazing. Filled with idea after idea, story after story. All so very, very good. The presentation that spoke to me the most was that of my friend Barbara Barry. I don’t think I am alone in that thinking, as the crowd of 400+ rose to their feet at the end of her presentation, many with tears streaming down their faces. She spoke from the heart, resonating with so many of us, and was just extraordinary. Much like Barbara herself. 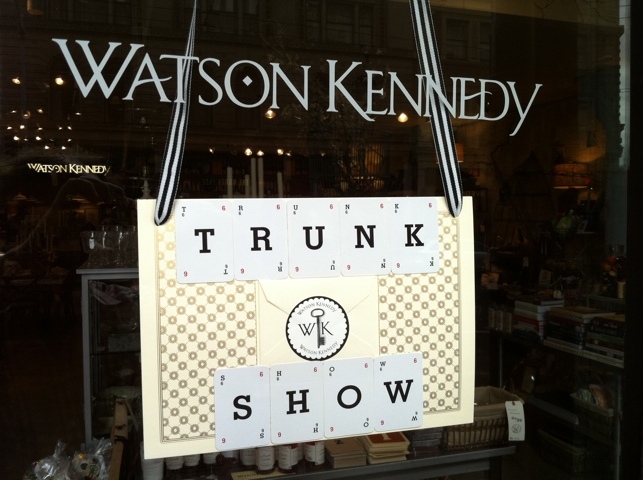 Her presentation was based on her book, ‘Around Beauty’ which we have been selling at Watson Kennedy. Her prevailing thought is that beauty is all around us, we just have to see it. Barbara and I are so in agreement on that life assessment. It is the bond we share. The bend of a flower, the curve of a bowl, the color of a freshly poured cup of coffee–all have great beauty. We just have to see it. It was such a special treat to hear her presentation and be able to spend a bit of time with her. I snapped the above photo just as we were leaving Los Angeles yesterday. The below I took just as we arrived in Santa Barbara. 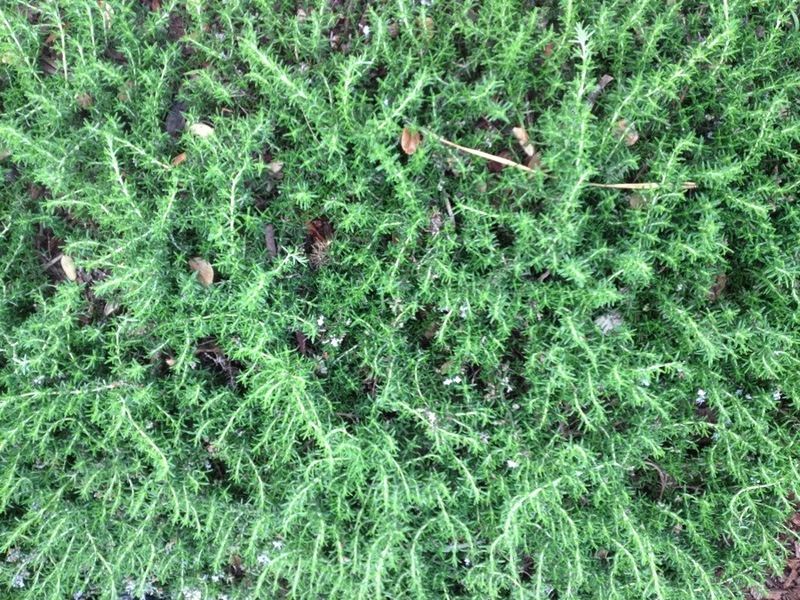 Just simple beauty, constantly around us. 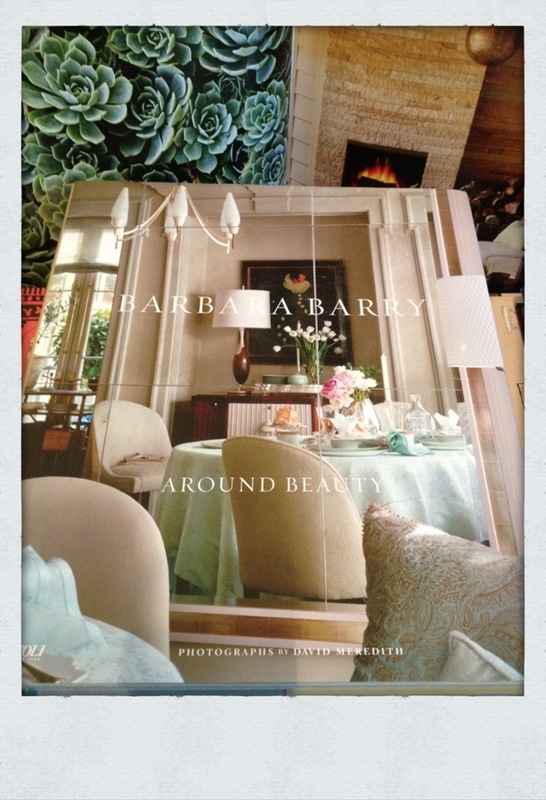 I am so excited to report that a big stack of “Barbara Barry: Around Beauty” books arrived yesterday at Watson Kennedy. The highly anticipated first book by Barbara Barry was so very worth the wait–I ordered big stacks for the shops as I know so many of our customers were elated once they found out Barbara was creating a book. This is no ordinary design book. Stunningly photographed, she takes the reader along her journey of design, but what I find most special, the journey of her life. Quality & beauty surround her, as it does all of us. 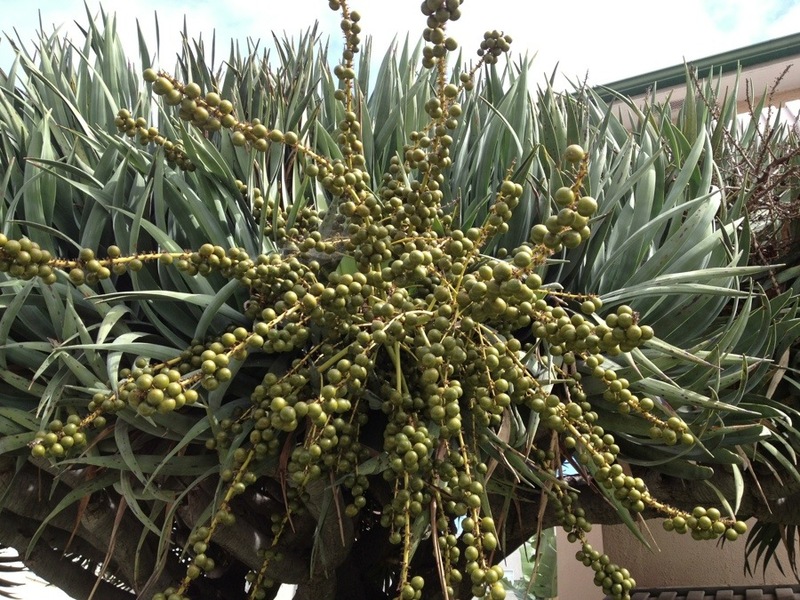 Being aware that it is there, and seeing it in all the small details is the key. This book is a lesson in doing just that. I feel so honored that Barbara is writing the foreword to my book. The first time we met, there was an instant connection to both of our love of beauty. Her new book is a lesson in living a gracious, well-ordered, thoughtful life where beauty is a key element. 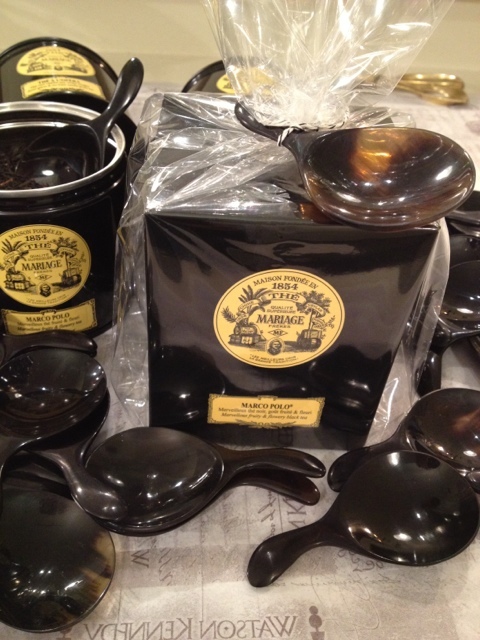 These lovely horn tea scoops just arrived yesterday at Watson Kennedy. 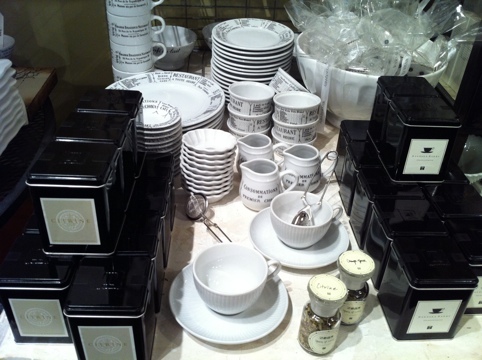 I thought they were the perfect addition to a tin of Mariage Freres or Barbara Barry tea, and was tickled to find them. The beauty of the variation of color in the horn, with the blacks & browns is spectacular. I tied one off on a tin in a cello bag–all set to be given as a gift–and a stylish gift at that. 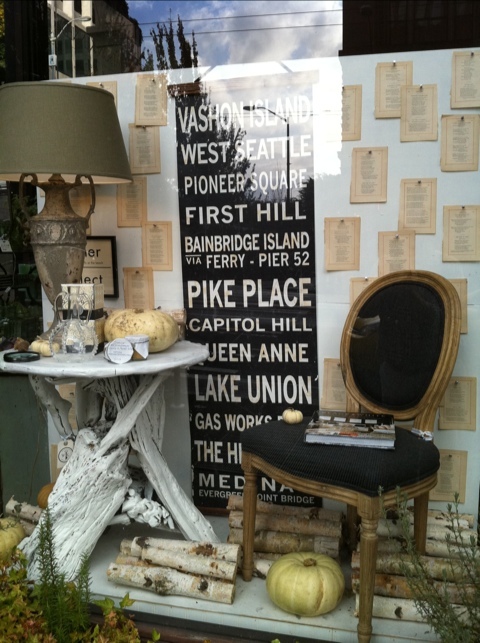 Creamy white pumpkins and white birch logs, now that might help shape a window, was my thought as I walked the show in New York in sweltering heat in August. I am always looking for one or two elements that pull a window together. I also like to have a window be more wintery and less Christmas-y till after Thanksgiving. Sadly, Thanksgiving often gets overlooked in the retail world. 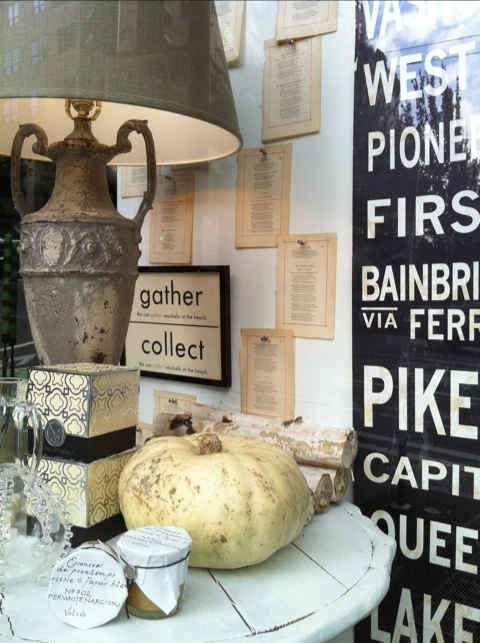 The vintage, oversized flash card worked perfectly tucked behind the urn lamp. I pinned pages from a poetry book by Robert Burns that I found falling apart at a flea market in London. 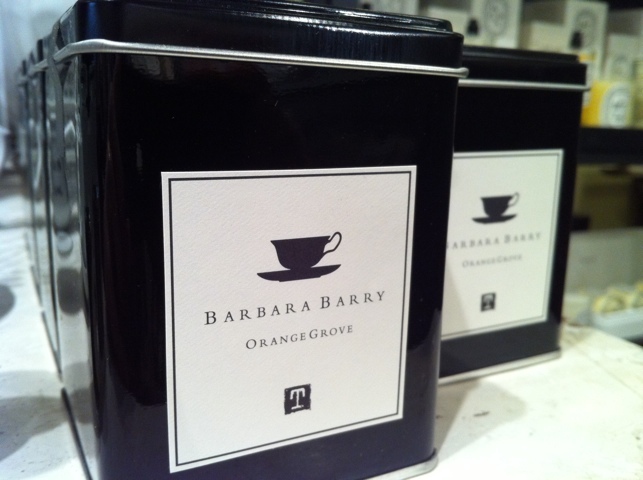 I am over the moon thrilled to now be offering 2 very special tea blends by design icon, and Watson Kennedy customer, Barbara Barry. Her newest, Orange Grove, smells as yummy as it tastes. 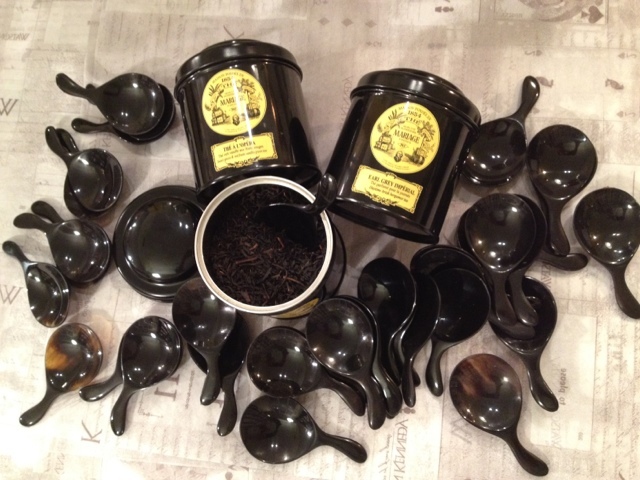 It perfectly blends Madagascar orange peel, Tahitian vanilla beans, and an exquisite oolong. Just typing all those ingredients made my taste buds tingle. 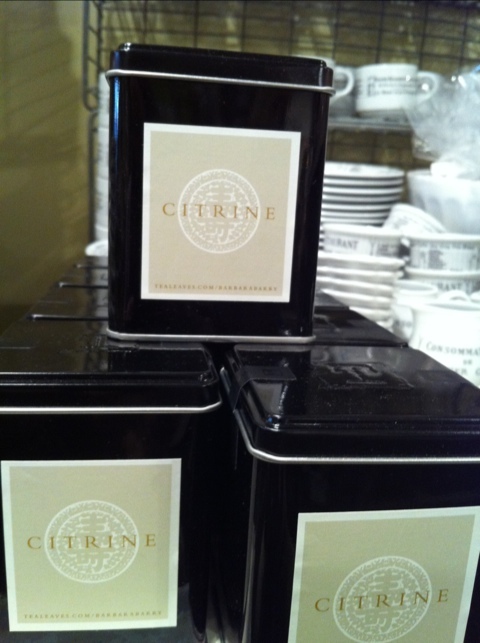 Citrine, has well composed layers of French verveine, Arabic chamomile, Thai lemongrass and organic peppermint. 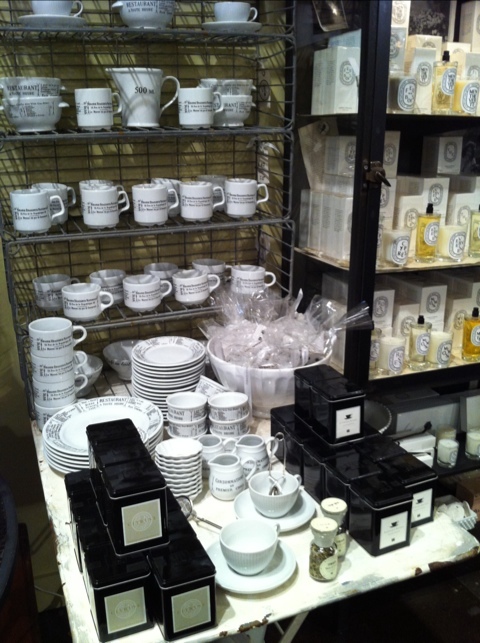 The teas come in a beautiful black tin, ready for stylish gift giving. They have found a very good home. We are always happy to gift wrap and ship–to any tea lover on your list.